I love monster toys (as demonstrated in these Blog-O-Ween posts), but my favorites are those capturing Frankenstein’s monster. He’s been done so many different ways in numerous scales, and each one is delightful in its own way. As you can see on the shelf, I have quite a few. Let’s talk about some of my favorites. In the ’70s monster toys were really popular. Ideal made the Scare Cycles to join in the craze. These cycles were gyro-powered and had glow in the dark features. They are not the rarest toys in the world, but they are hard to find complete. Other Scare Cycles were Dracula and his Coffin Cycle, and Bone Shaker with his Hearse motorcycle. I love the skull on the front of the bike and Frankie’s Fonzie costume. He is definitely one of my favorite pieces. Most people know Mego as the premiere company that created 8″ scale action figures in the ’70s, but there were other companies making figures in this scale. Azrak Hamway International (AHI, for short) is one of the best in the monster knock-off game. They created a line of Universal Monster toys to compete with Mego’s Mad Monsters. Truth be told, the AHI Frankie is my favorite because the head sculpt looks very much like Karloff. The toys were so low-rent that there are eight or so variants. Some have green bodies, some have sweaters under their jackets, and some like mine look like a guy in a Karloff mask with no shirt. They are highly sought after toys for Mego-scale collectors, and because there are so many variations, it can get expensive to find them all. The Remco Frankenstein also has a very Karloff look to it. Remco created not only this scale in their monster line, but also a line of 3 3/4″ figures. This guy is really cool because he glows in the dark, and he glows like crazy. He also has a nifty hugging action, since his arms are segmented. His costume is straight from the 1931 film. Remco monsters in both scales are popular collectibles for monster collectors, but they’re not terribly expensive. Finding one in good condition can be difficult if the arms are rough or the clothes are missing. Finally, there’s the Mego Frankenstein. 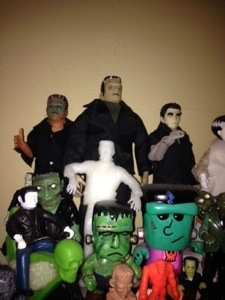 He was part of the Mad Monsters line, which included the Mummy, Wolfman, and Dracula. Each of these toys had glow in the dark hands, but Frankie here also has a glow in the dark head. His clothes are tattered, which is really cool, but his face is definitely not Karloff. He is the silliest of the Mego scale monsters, which falls in line with the rest of the Mad Monsters. Finding these in good condition is not impossible, but they have been remade in the last few years in different colors, so be careful when looking for these that they have the Mego markings on their backs. Not pictured here (but in other photos in this feature) are my favorite modern toys in this scale. First is Diamond Select Toys’ Bride of Frankenstein. I’ve had a few Bride toys in my collecting tenure, but this one is my favorite, mainly because she falls in scale with my vintage Frankies. She’s almost as detailed as the 12″ Sideshow Collectibles figure I had, from her face to the garments she comes with. The other is Heroes Entertainment’s Lincolnstein. Yes, it’s Abe Lincoln as Frankenstein’s monster, and it’s as fantastic as it sounds. 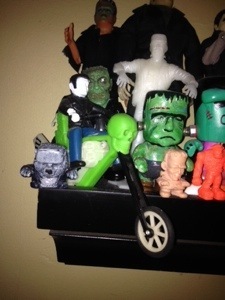 I own Lincolnstein and the Creature from the Watergate Lagoon, and they’re some of the most fun toys I own. The next series is going to be released soon, and includes one I have to own, Yeti Roosevelt. Hilarious! I’m going to start with my favorite in this bunch, the Big Blast Madman. Technically, it’s not a Frankenstein toy, but Madman’s name is Frank Einstein, and he was brought to life by a mad scientist, so his origin is similar enough for me to count it. This figure is actually a ToyFare exclusive variant and is unmasked. He fits perfectly on this shelf, and though better Madman figures have since been produced, I have a soft spot for the Big Blast scale and sculpting. Next up, Frankentroll. These guys are hard to pin down in terms of origins. They appear to be dime store toys, and they’re weirdly awesome. The head is one of the best Karloff likenesses I’ve ever seen, and it’s paired with a good luck troll body and red felt smock. Sometimes these little guys have troll hair, and when I bought this one, I had a choice. I picked the one without weird fuzzy hair because it seemed like the better choice at the time. Had I been smart I’d have bought them both. So in the ’80s, things like Madballs made monsters appealing even when they were round. Slobulus is a monster of sorts who definitely has a Frankie vibe. And beyond that, the Illco Frankenstein ball meant that you could throw the monster around on the playground. As a monster toy, it’s really cool, but as a ball, it doesn’t work as well as it should. And for some reason his eyes are closed. I don’t know if he’s sleepy or if he’s afraid of being thrown. He is rocking some killer purple eyeshadow, though. 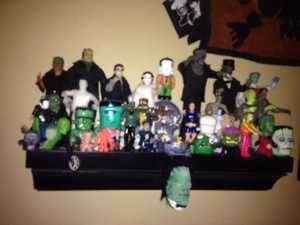 By no means is this even a fraction of the Frankenstein toys out there, but these are some of my favorites. I’m always on the lookout for that perfect monster toy, and Frankie is usually my first choice. Give some of these a try, and I guarantee you’ll love having them in your collection. 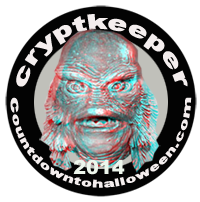 Tags: blogoween, frankenstein, halloween, monsters, toys. Bookmark the permalink. Great collection of creatures there! Any idea where that tan Frankenstein fast food premium, with the blue pants/shirt and yellow belt came from (the one in front of the Mezco Frank)? I have him and a Werewolf that seem to be from the same series…I’m trying to figure out what line they’re from, to see if there were any more produced. Hi there! Thanks for the comment. 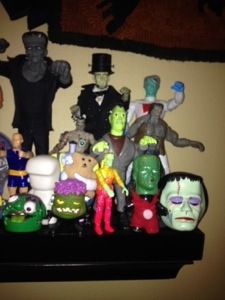 Sadly, that’s the only Frankenstein toy I have that I can’t ID. I bought him at the flea market from a quarter bin, and know nothing about him except that he’s probably a fast food premium. I’ll certainly post an update if I ever find out, though!